The funding of the arts: a tragicomedy in endless acts. 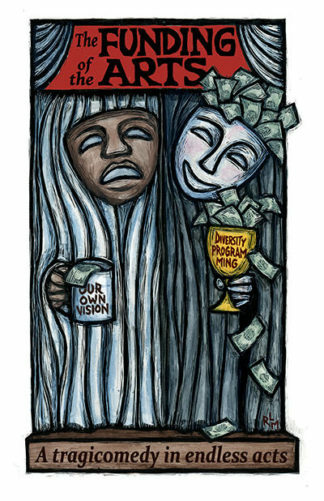 Peeking through the stage curtain on the right of this poster, a white mask holds a cup labeled “diversity programming.” The cup overflows with grant money from nonprofit, corporate, and government funding. 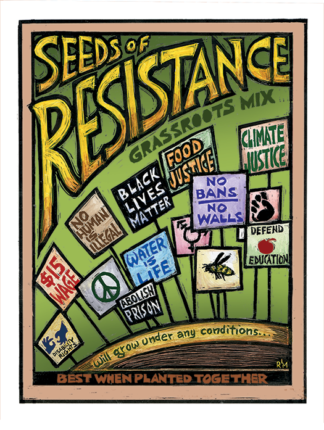 On the left, a black mask holds a cup titled “Our Own Vision,” which is nearly empty.